This marks the first day for The Blood of the Hydra blog tour hosted by Barclay Publicity. Today is also the release day for it as well, which is super exciting. I will be sharing my review and thoughts on this book, and let me tell you, it was absolutely astounding. Also make sure to check the bottom of the post for a special giveaway; Michelle is giving one(1) copy of any elemental book of the winners choosing. Whilst first reading book one in this series back in January I came to a realization of one very important thing. Michelle Madow's books have such a uniqueness that can't be topped. Within the Elemental series, we have withes, elemental magic users, and Greek mythology. Everything that makes this story amazing, is all held accounted for by the amazing writer, Michelle Madow. All in all I would give this book a 6 out of 5 stars. My absolute favourite thing about this series is the overall story line. I has many different adventures all packed into one. With the adventurous aspects, we are also given swoony romances between the characters as well. In The Blood of the Hydra I particularly enjoyed the tasks the Elementals had to go on in order to get further on within their journey to save the lord. I loved witnessing the Lotus Island, however the adventure I enjoyed reading the most was when they faced the Hydra. We, as readers are exposed the rawness of each character when faced in tough situations. I was also happy that the rest of Nicole's friends finally were informed of the little secret she had been holding. Another awesome aspect to this story are the characters. Each one of the five Elementals bring upon a different aspect to the overall stories. Nicole has yet again shocked me, as the story progresses, I as a reader loved seeing the way she developed into her magical self even more in this book than the first. With that being said though, I also really like that there is still room for her to grow and improve, therefore I am super excited for book 3 to be released. I also really liked getting to see the changes in Danielle. She was my least favourite character winthin the first book, however I really liked the way she grew. She definitely grew on me as the books went on. I also really enjoyed the heart to heart Nicole and her had. The last character I really enjoyed was Blake, but that was already a given since I really enjoyed him within the first novel. 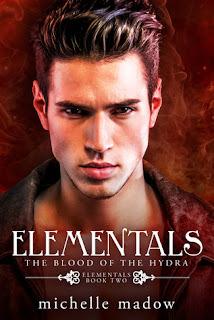 In conclusion, Michelle Madow's Elementals: The Blood of the Hydra should be on everyone's TBR list if they not only enjoyed The Percy Jackson series, but also for those who enjoy the good use of story telling that revolves around magic and myths. I highly recommend this book, and hopefully for those who have read it will enjoy the book just as much as I did.